Sometimes, we think that Rocket Raccoon should be the leader of the Guardians of the Galaxy. Let’s just take a moment to compare the anthropomorphic furball with the current leader of the team, Star-Lord. Rocket comes prepared to every situation with a bag full of guns, explosives, tools and other miscellaneous gear that he might need on a mission. Star-Lord never has more than 12% of a plan. Rocket Raccoon’s best friend is a nearly indestructible tree with some crazy combat abilities. Star-Lord’s best friend is an angry blue Cenaurian. Rocket has a thick coat of fur. Star-Lord has a red coat, which is admittedly pretty cool. Well, you do the math! Rocket seems like he’s a way cooler choice as leader for the Guardians of the Galaxy. Now, your kid can have his chance to muscle his way into role of Rocket (and maybe become the NEW leader of the team). 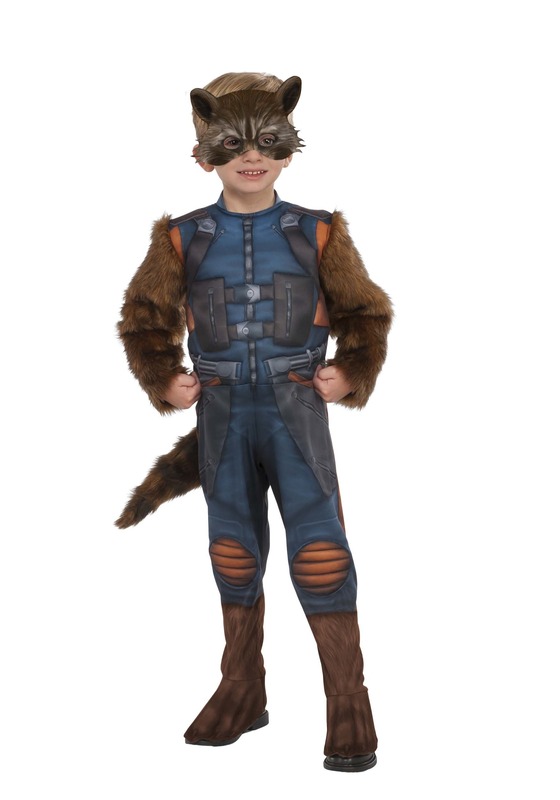 This licensed toddler Rocket Raccoon costume comes with everything your child needs to become the intergalactic superhero! The costume comes with a full-body jumpsuit with printed details on the exterior. The sleeves and feet have faux fur on the exterior to make your child look like the crazy critter from the movie. The pants end in boot covers, so your child can wear his normal shoes underneath this outfit. Finally, the face mask fits with elastic and has a pair of raccoon ears molded into the top. Your little one will feel just like the legendary raccoon in no time! I will be ordering more costumes from here. This size was perfect for my two year old.